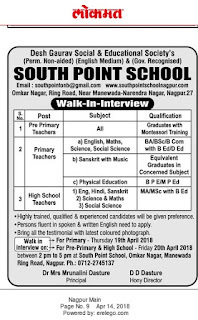 South Point School, Nagpur has advertised in THE LOKMAT newspaper for recruitment of Pre Primary/Primary/High School Teachers jobs vacancies. Interested and eligible job aspirants are requested to walk-in on 19th and 20th April 2018.Check out further more details below. 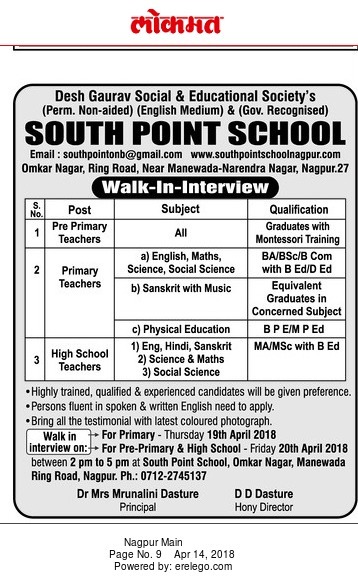 Name of the School: South Point School, Nagpur. 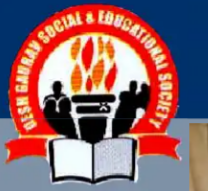 About School: South Point Group of Schools are English Medium Co-educational schools run by Desh Gaurav Social and Educational Society. The school was established in the year 1994 by Shri Dinanath Dasture, a Civil Engineer by profession, with an aim to do social awakening for quality education by opening quality educational institutions to cater the needs in southern Nagpur. Such facilities were lacking in Southern Nagpur as compared to Western Nagpur. (a) Pre Primary Teachers: Graduates with montessori training. Equvalent graduates in concern subjects. (c) High School Teacher: MA MSc with B.Ed. Fluency in English/ written in english is Must. Highly trained qualified and experienced candidates will be given preference. How to Apply: Bring all the testimonials with latest coloured photographs. For Pre Primary & High School: Friday 20th April 2018 from 2 p.m to 5p.m. Venue: @ South Point School, omkar nagar,Manewada Ring road, Nagpur.